Virgin and abbess of Montreuil, three miles from Seez, an episcopal see in Normandy, of which her brother, St. Chrodegang, was bishop. This holy prelate, returning from a pilgrimage of devotion which he had made to Rome and other holy places, went to pay a visit to his cousin, St. Lantildis, abbess of Almanesches, in his diocese; but was murdered in the way, at Normant, on the 3d of September, 769, by the contrivance of Chrodobert, a powerful relation, to whom he had intrusted the administration of his temporalities during his absence. He is honored in the Breviary of Seez on the day of his death: his head is enshrined in the abbey of St. Martin in the Fields, at Paris, and his body in the priory of Isle-Adam upon the Oise, near Pontoise. 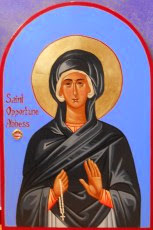 St. Opportuna did not long survive him, dying in 770, on the 22d of April, having lived an accomplished model of humility, obedience, mortification, and prayer. Her relics were carried from Seez during the incursions of the Normans, in the reign of Charles the Bald, to the priory of Moussy, between Paris and Senlis, in 1009: and some time after to Senlis. In the reign of Charles V., in 1374, her right arm was translated to Paris with great devotion and pomp, and deposited in the church which was built in her honor, in the reign of Charles the Bald, to receive a former portion of her relics then brought from Moussy. It was then a small church, built at the entrance of a wood, near a hermitage, called before, Notre Dames des Bois Paris. The town being since extended much beyond this church, it was made parochial and a collegiate of canons. Great part of the head of St. Opportuna remains at Moussy; her left arm, with part of her skull, at Almenesches: one jaw in the priory of St. Chrodegang, at l'Isle-Adam, and a rib, with her right arm, in her church at Paris. In processions, when the shrine of St. Genevieve is taken down, and carried, the ancient portion of the relics of St. Opportuna, kept in a large shrine, is also carried next the shrine of St. Honoratus. She is commemorated in the Paris Breviary, and is the titular saint of a parish in that city.